Here are the designs and I'll like any feedback. One-foot increments are shown on each drawing and the drawings are accurate to better than one inch. This is the design we are going to use. This design expands to the east. The porch would then be redone and moved farther east. It will be a little narrower than current porch but about the same length. 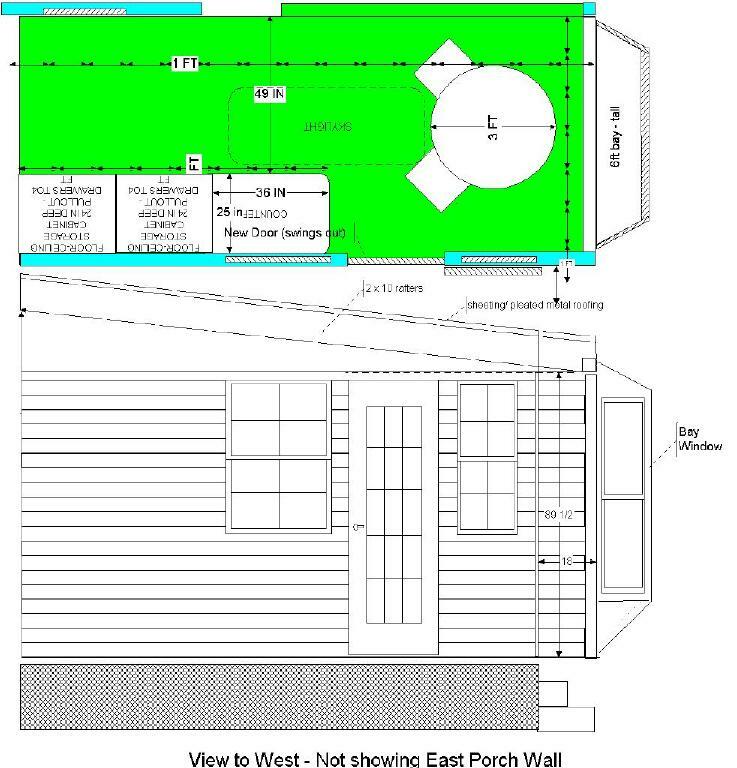 Extension and new porch will have a shed roof as in current design. 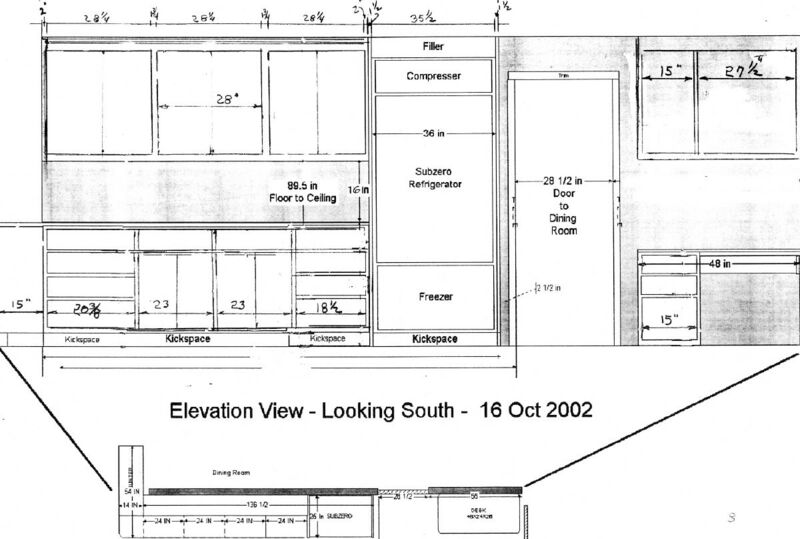 However, roof will be a rubber roof so that slope can be less than current design and maintain full kitchen ceiliing height of the new area all the way to the north wall. A skylight will be installed in the expanded kitchen area. There appears to be a little less overhead cabinet space compared to the original kitchen, but the double storage cabinet more than makes up for it. 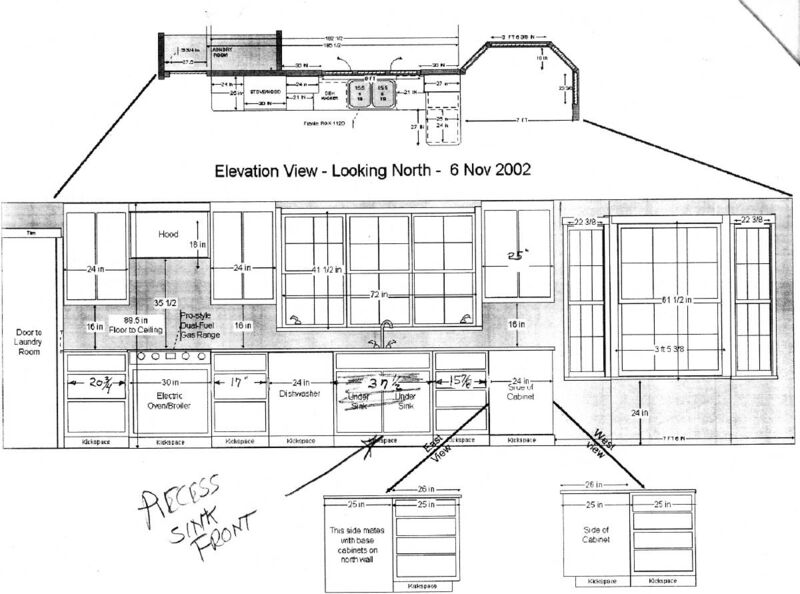 Counter space (and under-counter cabinets is a little more than current design. Expansion is only 7 ft to the east - limited by stained glass window. The area in green is the new breakfast area, which includes the removed old east wall. 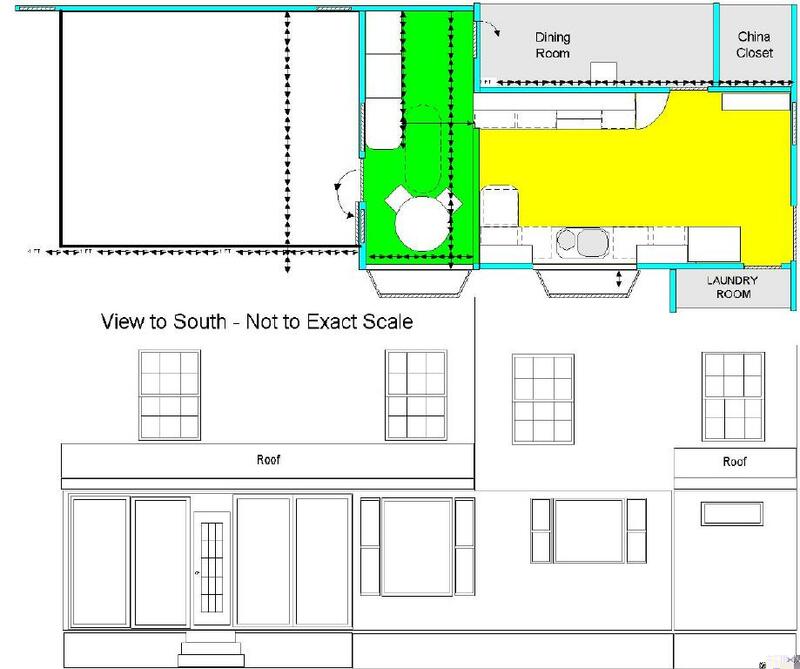 The area in yellow is the existing kitchen floor area. Pro-stype stove with gas range and electric oven/broiler. Hood vents out through laundry room roof with vent motor outside. 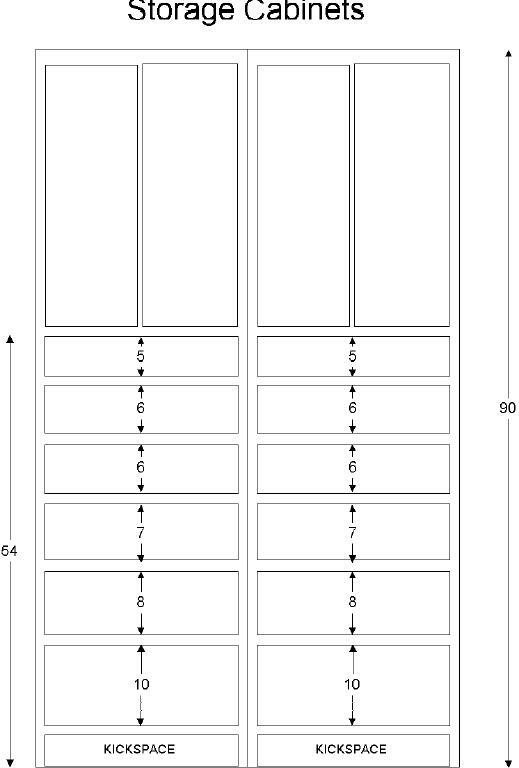 Good symmetry on cabinet sizes. Using standard cabinet sizes (3 in increments). 2. Elevation looking to east wall. Shows new door to porch. Door opens out. Note that ceiling is sloped. Note on cabinet that juts out, there are drawers on the sink side inboard and on the breakfast room side outboard. 4. Elevation looking to west wall from inside breakfast area. Note that ceiling is sloped. Walls in breakfast area shown in a darker shade. 1. Elevation looking to south wall. Three overhead cabinets rather than four gives more reasonable width per cabinet. Left cabinet ends 2 in before end of wall. Overhead cabinet over desk has one wide and one narrow width. Double cabinet will be built as a single 54 in wide cabinet. Total space for cabinets and wet bar area turned out to be less than originally planned. The wide cabinet will have drawers rather than slide-outs. 3. Elevation looking to north wall. Recess in sink cabinet requires wider cabinet. Widths of drawers shown. Hood will be 28 in above counter. Separate gas cooktop and wall oven under it will be used instead of dual-fuel range.